Estate living is one of the fastest growing property trends in SA, boosted by the demand for a quality lifestyle in a secure environment. Benefits of the Cape’s country estates including that while able to enjoy a rural lifestyle, you are still within easy reach of main business nodes, the international airport, and top schools according to Samuel Seeff, chairman of the Seeff Property Group. Additionally, the estates also offer many unique features such as wineries and vineyards, olive groves, eco-trails, and equestrian facilities in addition to lifestyle, clubhouse and golfing facilities which are often found in estates. For the luxury of a quality lifestyle and top security, buyers are often prepared to pay a premium of 20%-40%, according to Seeff, and it is not uncommon for top homes to sell for R5 million to R20 million and much more, especially in high-end country estates in the Constantia Valley, and in the Cape Winelands, especially Franschhoek, Stellenbosch and Paarl. Lightstone reports that there are about 6,500 gated and estate properties in SA with 25% of these located in the Western Cape and over 50% in Gauteng. It says further that estate property sales comprise of about 5% of all sales in volume terms and around 15% of the overall property market value. Prices tend to average at nearly three times the national average price. 1) Silverhurst Estate, Constantia Upper – Median property value R15.85m – surrounded by the beautiful mountain and vineyard landscapes, the estate offers large plots and luxury homes in a 24-hour security estate with strict access control. Residents have access to stunning grounds with a lake, meandering pathways and two lawn tennis courts. It is close to all of the attractions of Constantia as well as excellent schools. Prices tend to range from R8m-R28m, but a top-end home can range well above this. 2) De Zalze Winelands Golf Estate, Stellenbosch – Median property value R10.8m – Karen van Niekerk and Lara Maritz, agents with Seeff Stellenbosch says that De Zalze is a top estate which includes a working farm, vineyards, citrus orchards and olive groves. Part of the estate is wetlands with dams which attracts a variety of birds and fish. There is also a top-class golf course and clubhouse. It is across from Techno Park and offers easy access to Stellenbosch, Somerset West and Cape Town. There is a mix of freehold and sectional title property, and De Zalze is a prestigious address which has always been popular with the more affluent market. It also swallow-buyers from the UK and Northern Europe. Freehold houses range from around R8.3m-R30m. 3) Winelands Estate, Paarl – Median property value R9.65m – Tania Van Deemter and Marianne van der Merwe from Seeff Franschhoek says that this is the quintessential country estate with stunning views of the Simonsberg, Paarlberg and Du Toitskloof mountains. It is located in the Drakenstein Valley and offers just 35 freehold stands ranging in size from 4000sqm to 1.1ha. Residents enjoy clean air, wide open spaces, supreme privacy, vineyards and olive groves. The estate attracts a mix of residential and second home buyers including foreign “swallows”. House prices range from R9m-R20m. 4) Domaine des Anges Estate, Franschhoek – Median property value R8.4m – according to Tania Van Deemter and Marianne van der Merwe says that while Franschhoek is home to several exclusive country estates, Domaine des Anges ranks as the most sought-after. The estate includes beautiful citrus and olive trees and vineyards and communal facilities such as a clubhouse with gym, communal pool and floodlit tennis courts and only 42 houses. It is within walking distance to the town and attracts a mix of residential and second home buyers. Prices range from R7m-R17m, but homes are on the market to around R20m. 5) Silvertree Estate, Tokai – Median property value R7.85m – Jane Winter, an agent with Seeff Tokai says the beautiful estate, located at the bottom of Ou Kaapse Weg in Tokai offers close proximity to top wine farms, beaches and upmarket shopping complexes. Reddam School, a co-ed private school which caters for pre-school to matric, is adjacent to the estate and children can walk to school via a secure gate access. There is also a bus which shuttles children to and from the International School and makes the estate a top choice for international clients who rent top-end homes. Prices range from around R7m-R13m on average. 6) Kenrock Estate, Hout Bay – Median property value R7.55m – Lauren Zuidema, an intern agent with Seeff Hout Bay says there are several stunning country estates in the Hout Bay Kenrock Estate being a top choice eco-estate which offers low-density living, wetlands, indigenous vegetation and dams. There are 94 homes and over 13ha of communal grounds as well as 2,5km of nature trails. It is located at the foothills of Table Mountain where mountain and valley meet and offers fabulous vistas. The estate attracts affluent buyers and is popular with “swallows”, especially German nationals who absolutely love the SA countryside and find Hout Bay’s easy access to Cape Town and the airport a big draw-card. Prices range at around R6m-R12.7m on average. 7) Delta Crest Estate, Stellenbosch – Median property value R6.9m – Tania Van Deemter and Marianne van der Merwe from Seeff Franschhoek says that Delta Crest offers just 21 houses and facilities such as paddocks, vineyards and plenty of open spaces. It is close to Bridge House School and popular with families. Prices range from R7m-R9m on average. 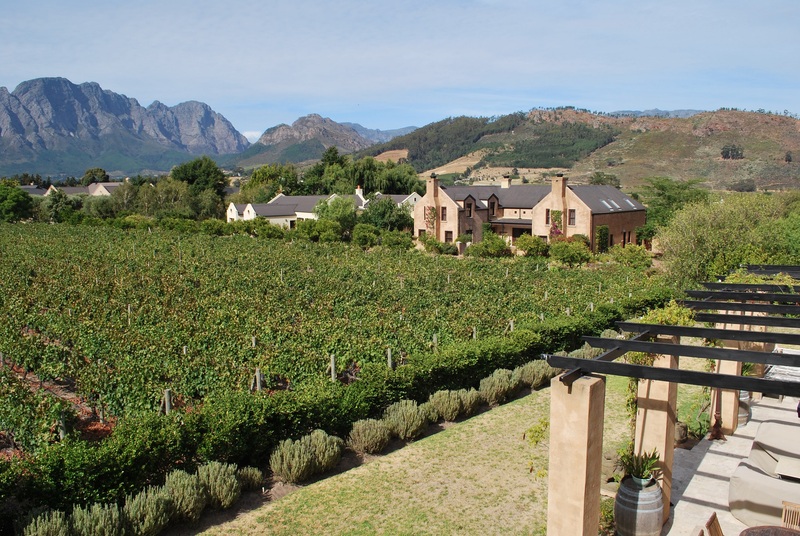 8) Santé Winelands Estate, Paarl – Median property value R6.2m – Clive Hartman from Seeff Paarl says that this working wine estate is also home to the luxury Santé Hotel, Spa and Conference Centre along with just 32 exclusive properties set among vineyards and olive groves. It is close to Cape Town, Paarl, Franschhoek and Stellenbosch and attracts residential and second home buyers including foreign buyers from the UK and Northern Europe. Plots are large, ranging from 4 000sqm to almost 2ha, the latter with its own private vineyard or olive grove, fully maintained by the estate. The mountain and vineyard views are spectacular, the air clean and crisp and the living as healthy as you can get, all within a secure environment. There is plenty of space for walking and cycling and dams that offer fly fishing. Homes are in a distinctive Provençal style with prices ranging upwards of R8.5m for a 1.7 ha property. 9) Val de Vie Estate, Paarl – Median property value R5m (full title) – this stunning wine, polo and golf estate needs little introduction and comes with stunning grounds with landscaped gardens, parks and open areas for children to play, 42km running and cycling trails, fishing and picnic spots along 7km of pristine Berg River, the iconic Pearl Valley Jack Nicklaus Signature Golf Course, tennis and squash courts, swimming pools, lifestyle centres, outstanding restaurants and top class equestrian and polo facilities. It hosts various high-profile events annually and attracts affluent buyers from across the country as well as an interest from foreign buyers. There is a mix of property options including sectional title, golf and polo homes and luxury homes on large plots overlooking the polo fields. Freestanding houses sell for around R4m-R35m with top-end homes ranging well above this. 10) Croydon Olive Estate, Stellenbosch – Median property value R3.6m – Karen van Niekerk and Lara Maritz from Seeff Stellenbosch says that the estate offers an excellent opportunity to invest in a stunning estate at affordable prices. It offers easy access to Stellenbosch, Somerset West and Cape Town and is close to good schools. It is a working olive farm which produces its own olive oil. Property owners also receive an annual quota. It attracts mainly residential buyers and some investment for the rental market. Vacant plots are priced from R1.3m and you can buy a luxury home for around R3.m-R6.5m.